Newland Gardens brings us back to Cheltenham! We have returned to Cheltenham with the launch of Newland Gardens, a collection of exclusively open market two, three and four bedroom homes. Located off Pilgrove Way in Springbank, Newland Gardens neighbours a former Newland Homes development, Newland Park which was completed around 2005, and provides an ideal opportunity to enjoy the finest aspects of urban living whilst bordering the historic town of Cheltenham Spa. The 34 properties offer a collection of two, three and four bedroom houses and apartments, all thoughtfully planned with open layouts and practical living in mind. The houses have been designed to echo the Regency details that feature in homes across Cheltenham, whilst also providing modern living space suitable for first time buyers and growing families alike. 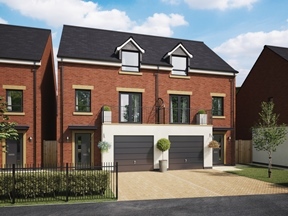 The four bedroom Draycott style home has an eye-catching feature balcony to the first floor lounge, integrated garage and built-in wardrobe to the three double bedrooms. The marketing suite and showhome are open seven days a week from 11am until 5pm. For more information call 01242 300307 or click here.